I've been asking around about the best AC electric motors to put in your electric car conversions, and have discovered something wonderful: there's a new breed of AC motors for cars, this time for lower voltage systems. 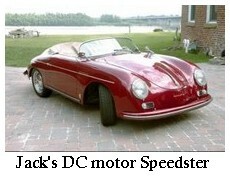 In a curvy fiberglass Speedster replica, it really flies! ...this Siemens motor on the right was used by Ford in their '90s era Ranger EVs. For the most part, though, AC motors were considered to be too expensive and too complicated for the average Joe to use in a conversion. Best left to the experts and the high-dollar hobbyist, they said - though we came up with some really good examples of people who did great AC conversions. That all changed when Hi Performance Electric Vehicle Systems - formerly known as HPGC - came up with 3-phase AC electric motors that are suitable for a full-size electric car, but for a fraction of the price we're used to (less than 5k USD for the electric powertrain instead of more than 15k USD!). They're calling it the HPEVS AC-50. And yes, it IS as good as you've heard. 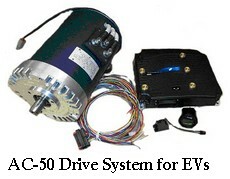 Who's using the HPEVS AC Electric Motors in their EVs? Jack Rickard from EVTV Motor Verks in Missouri, for one. He's built a couple of cute, fast little fiberglass replica electric sports cars using HPEVS AC electric motors and lithium batteries. I got a chance to ask him a few questions about his conversions the other day - it went something like this. Lynne: Your electric sports cars are beautiful, Jack. Can you tell me about them? Jack: I like them too. I never get over it. Both the Spyder 550 and the Ivory 356 Speedster use the HPEVS system, the HPEVS AC-50 electric motor paired with a Curtis 1238 controller. This controller is very robust and quite configurable. We like it a lot. ...something like that one, yes, that puts out 0-5vdc based on how much pressure you have in your brake line, in turn a function of how hard you press on the brake. 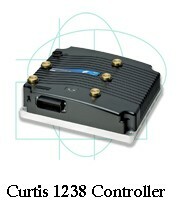 The Curtis will use this input to modulate the regenerative braking. The result is probably the best "feel" in regenerative braking we've every experienced on ANY electric car. 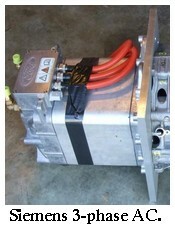 In your cars, you're running the HiPer AC electric motors at 120 volts? How is the acceleration at that voltage? These cars will do 130 mph. The acceleration is 0-60 in about 11.2 seconds. 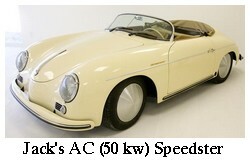 In the case of the Speedster, this matches the performance of the original 1957 model it replicates, and exceeds it slightly at all speeds from 0-10 kmh to 0-120kmh. How heavy a car can use these type AC electric motors? They're ideal for light vehicles less than 2500 lbs, I think. You could do a 3000 lb. vehicle, but it would not be stellar performance. At 2000 lbs, or in the case of the Spyder at 1840 lbs, it is very sprightly. Yes, the system is kind of bullet proof. I've seen people get the more high end AC system at 300 or 320 volts. Seems like a big difference in cost, if these AC electric motors work well! We're very happy with the performance, and it's relatively inexpensive at $4600 for the controller/motor pair. I asked Jack about the horsepower of an AC electric motor compared to a DC motor, and compared to internal combustion, in terms I could relate to. 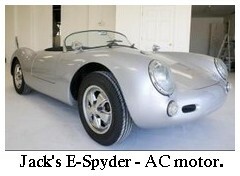 Jack has 2 electric Speedster replicas - shown here - one DC and one AC; so he can compare them side by side, "apples to apples" as it were. Lynne: So theoretically, this motor has 100 electric hp. Usually I guess I translate hp as "how fast will my car get up and go from 0-45?" but I don't know if that's really more true of the SW DC motor or if it's the same with the AC motors because I've hardly seen any of them. How would you say AC hp compares to DC hp, or am I thinking of this correctly at all? Jack: AC horsepower does compare with DC horsepower, and you're in deep water with horsepower thinking at all. But I'll try. An Internal Combustion Engine is usually rated in Horsepower. They list the PEAK or HIGHEST horsepower the motor can achieve and this is at a very specific RPM. Something like 3600 rpm for a V8 style engine or 4600 rpm for a smaller sports car engine. Just a few hundred RPM off peak, the engine rarely produces half that much horsepower. And at 1000 rpm, it might be 15 horsepower - from a 400 horsepower engine. Electric motors too are often rated in horsepower. The horsepower rating of an electric motor almost always refers to the amount of power you can run the motor at CONTINOUSLY for one hour, without burning up the windings. If it is a 10Hp motor, you could put 7460 watts of power in it for an hour before it burned up. Beyond that, we think of an Internal Combustion Engine as developing or PRODUCING horsepower. We think of electrical motors as consuming power or converting power. So while you can put 10 horsepower IN to that electric motor, the motor can actually take an unknown amount of power for a shorter period of time. It is not precisely a linear function. But if it WERE a linear function, you could say that that same 10 hp motor could do 20 horsepower for 30 minutes, and 40 horsepower for 15 minutes, and 80 horsepower for seven and a half minutes or 160 horsepower for 3 3/4 minutes, and well, you get the idea. In a car, the typical acceleration if you are in a DRAG RACE might be 14 seconds. In real traffic, you might accelerate for 7 or 8 seconds. And so as a practical matter, the motor will do whatever we put INTO it without limit for a brief burst. The torque output for a given power input will hold constant in an electric motor from ZERO RPM usually out to somewhere around 4000 to 4500 rpm. At that point it begins to taper off for various reasons I won't go into here. This flat torque curve is what makes the feel of an electric car so much more exhilarating than an ICE vehicle. The result is pretty much CONTINOUS acceleration up to about 4000 RPM - a very different driving experience. Different indeed. This is why we love to drive our electric cars. Thank you, Jack!